Creating new documents rather than deleting or updating older documents. This will preserve the history and integrity of documents. All documents have an audit-trail so you can can see the history of any changes that have been made from being assigned, reassigned, edited, completed by a candidate or new hire, to any additional changes made after being submitted and signed electronically. Customize the email notification that is sent to candidates in Administration. Include personal details like name and job applied to. Include instructions on how to complete the electronic documents and provide a contact person if they need assistance. Assign documents to candidates automatically through your job posting on the iConnect Forms Tab. OR assign forms on an ad hoc basis through the applicant profile page. Note you can select both single or multiple documents. Monitor form status. You can check the status of your forms on the iConnect form reports or on the Applicant Profile page. Both will show pending and completed documents. Send Reminders. Send a quick email reminder to any applicant who has not completed your documents in time on the Applicant Profile page. Re-Assign Forms. If someone alerts you that a mistake has been made on a completed form, you can reassign the form back to them, or make the fix yourself on the Applicant Profile page. Note all changes to the forms will be tracked on the audit trail. Attach documents or links for candidates to review. Link to your benefit carrier, website, or upload your employee handbook for viewing. New Hire Portal Content – the new hire portal is not limited to just documents that need to be signed. You can also provide content such as links to your website, social media links, video content and more. Please call us at 800-517-9099, or contact us below. 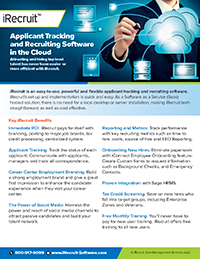 This entry was posted in Blog, iRecruit Blog and tagged ats, electronic onboarding, iRecruit. Bookmark the permalink.